After all the talk of the cruel "Blood Eagle" torture Jarl Borg was condemned to, I was glad to see Vikings Season 2 Episode 7 actually go there. Listening to Ragnar describe what the punishment entailed was more than enough for me; I didn't need to see more than what we were shown. Elsewhere, King Aelle and King Ecbert married off their children in order to unite Northumbria and Wessex against the Northmen. A second wedding took place in Kattegat as Floki and Helga tied the knot, but Ragnar was not invited to attend. A new Earl comes forth pledging four ships and one hundred men to help Ragnar raid Wessex. Were you surprised to learn who this Earl was? It was just a matter of time before King Aelle re-entered the story right? After all, history tells us that he's ultimately responsible for Ragnar's death. For right now though, uniting Northumbria and Wessex through marriage is a solid plan. Especially since we learned throughout the episode that our Viking warriors do intend to raid England again. With only three episodes left, it looks like we are headed toward a serious finale battle. Was anyone else surprised that Athelstan joined in the "God save England" chant? The Seer does explain a little later on that Athelstan's spirit is tormented. He really doesn't seem to know which world he belongs in, but he will no doubt have to chose and soon. Floki's reaction to the news that Helga was pregnant was the one most mothers-to-be dread deep inside. He started crying on top of everything. It's a good thing Helga understands that Floki is "complicated." In fact, he's so damn complicated that he invites King Horik to his wedding but tells Helga that Ragnar can not attend. Floki the priest is gone, why the jealously? I understand Floki was invaluable to the success of those first raids of England. However, I'm not sure where this resentment comes from. Ragnar has never mistreated Floki or turned his back on him. Aslaug showed a more vulnerable side tonight. Confiding in Siggy that she's afraid of this pregnancy only strengthens my belief (and many of our readers) that Aslaug dies in childbirth. The only famous son not mentioned so far is Ivar the Boneless. I imagine her next baby will be born fragile and weak as part of her prophecy. Will this baby indeed be Ivar? Does Aslaug die giving birth to him? Bjorn continues to chase after slave girl Poruun and tonight Ragnar told his son to think with the proper head not the little one. Does any teenager ever listen to that advice? Chances are when these lovebirds hook up, neither Ragnar nor Lagertha will be too pleased. King Horik visits an imprisoned Jarl Borg, who tells him Ragnar's ultimate goal is to be King. I honestly thought Horik would step in and help Borg but by allowing things to run their course, he's killing two birds with one stone. Borg was always a problem for him. Anyone else wonder how Horik got his hands on Borg's creepy skull? The scene with Ragnar watching everyone closely from the shadows was brilliantly shot, wasn't it? Bjorn and Poruun flirt, Aslaug talks to Helga about a very withdrawn Floki and Siggy chats up King Horik. Ragnar is not only a curious man, but an observant one as well. He's smart. Back in England, Aethelwulf of Wessex marries Judith of Northumbria uniting and strengthening both kingdoms against the coming invasion. I wondered to myself why King Aelle took the princess along on his journey to Wessex. Well now we know right? It served to speed up the story telling which gave us not one... but two weddings. Floki and Helga's Pagan wedding served as a nice contrast to the traditional Catholic wedding taking place in Wessex. Many similarities right? The rings, the exchange of vows, and Helga wearing white. Loved the music in this scene. I was disappointed that Horik was in attendance and Ragnar had been left out. Was that why Raggy was getting drunk and acting like a fool when the mysterious rider arrived? Ragnar heads out to meet this Earl with enough men and ships to make the upcoming raid a great success. Yes the Earl in question turns out to be none other than Lagertha. He doesn't seemed surprised but she reminds him that they are equal now. Earl Lagertha pledges four ship and over one hundred warriors to the cause. Ragnar teases her a bit but ultimately agrees. Obviously, we know Lagertha killed her husband but how exactly did she become Earl? I hope we get a bit more information on this. I enjoyed the scene with Ragnar and Aslaug watching Lagertha train. He thinks the Gods are playing a joke on him but Aslaug says she likes her. Will the two women actually become friends? Now that would be interesting don't you think? "Blood Eagle" finishes up with Jarl Borg enduring this inhuman torture. As I mentioned at the top, hearing Ragnar explain what it is was enough for me. When the door to Jarl Borg's cell opened and we could not see who approached him, I knew Horik had betrayed him. 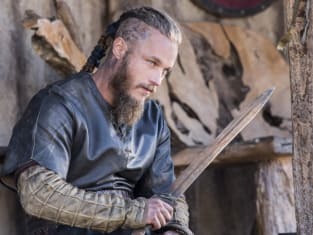 That guy is a snake and we now know that Ragnar can not trust him. Borg accepts his punishment as everyone looks on and the first cut is made. Blood spills everywhere. Next comes the axe but Borg remains quiet and strong. Aslaug, Siggy and Helga are forced to look away but Lagertha does not. Is it any wonder this formidable warrior is now an Earl? The Seer's prophecy unfolds as an eagle appears before Borg, and he is also the eagle. Powerful stuff. 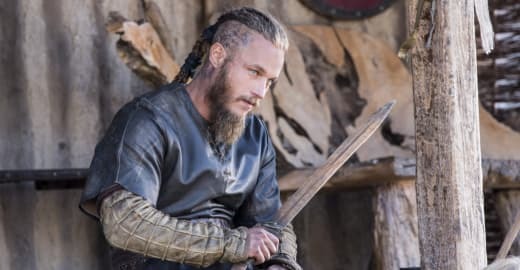 There's only three episodes left, if you've missed one or just want to catch tonight's again watch Vikings online right here at TV Fanatic. Do you think King Horik will keep his promise to Jarl Borg and attempt to kill Ragnar?